Bilbo has dressed as the Grinch and he and his hound Max are going to steal all of Sauron's Christmas presents! 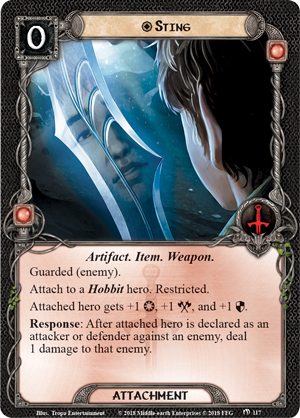 I have included all guarded treasures but Thror's ring because this is an all hobbit deck that I want to pair with my other all hobbit deck. The deck uses the Sam & Rosie Cotton team for defending and questing. Load Sam with his toys from previous Christmas, Hobbit Cloak, Staff of Lebethron, Armored Destrier, and once Bilbo or his hound Max get the Necklace of Girion, dress Sam with it. I am sure Rosie will find him very handsome. Rosie gets a Fast Hitch so she can activate her power during the Quest and Combat phase. Your main attacker is going to be Folco Boffin in ninja mode! Bilbo will fetch the toys for Folco. This are Glandring and Orcrist. Give him also a Fast Hitch upgrade him to a real dual-wielding-murderhobo!! Sting and the Arkenstone go on Bilbo. Don't even think on doing it a different way, these are his toys! The allies I have included a bunch of expensive unique allies to take maximum benefit from the Arkenstone. Note: If you are playing this deck in solo. Change Beechbone and Skinbark for Treebeard and Quickbeam. 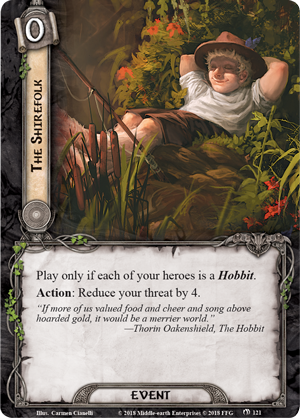 If you team it with my other hobbit deck, remove Firyal and add another of Bilbo's hounds. Resource acceleration In between Orcrist, Necklace or Girion, Resourcefuls and the Elf-Stones, you will be stealing loads of resources! The first Resourceful is better to be played on Sam, unless he already has the necklace. That will give you the option to take maximum effect of Heed the Dream early in the game. The Errand-riders are here to smoothen the resources according to your needs. Thread management I have used Well-Equipped as a proxy to The Shirefolk. What an amazing card! 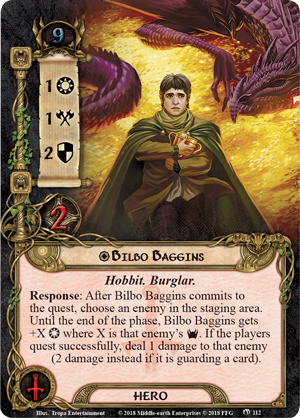 In multiplayer, if you pair this deck with for example my other hobbit deck, you can also discard Folco to reduce your thread by 7 before giving him his toys and then bring him back to life with Fortune and Fate.